Thanksgiving is fast approaching in Canada, and traditionally, this means visiting with friends and family and sitting down to a yummy turkey dinner with all the trimmings. If you are lucky enough to be invited to someone's home for this Thanksgiving (or at any time of year) it's traditional etiquette to bring a gift of some kind, rather than showing up empty-handed. The host or hostess was kind enough to invite you and has gone to considerable time and effort preparing their home and the meal. If you are invited to a dinner party, a special event, or especially if invited to an overnight stay, presenting a gift upon arrival is the way to go. But what to bring? Gift giving may have cultural considerations, but generally you can't go wrong with edible gifts of fairly mainstream food selections. You might want to ensure that your hosts enjoy sweets or chocolate, and if not, then go for other foods. And of course, the safest and loveliest gift is flowers or plants. 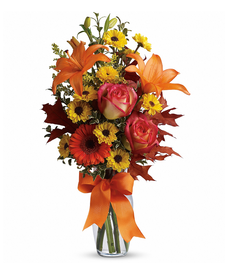 Flowers are pretty much universally accepted gifts that are sure to be appreciated by your hosts. For holiday events, it's an even nicer gesture if you can keep your selection in keeping with the season. 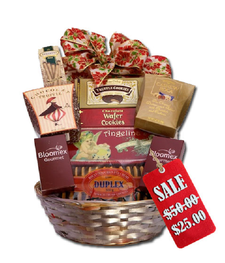 This is one of the best deals around, featuring an assortment of decadent treats such as chocolate, tea, coffee, cheeses, nuts, seafood, crackers, all attractively packaged for you. It's also on sale for half price, which makes it all the more attractive! 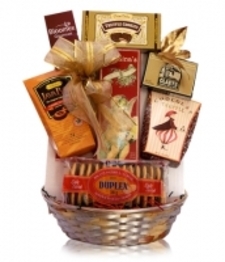 For only $25.00 you have a fantastic gift that is sure to please, and you can arrive guilt-free. Your hosts are sure to appreciate a sweet treat that they can enjoy after the guests go home! If you know that they eat sweets then this is an excellent choice and great bang for your buck at only $39.99. This is the perfect choice for any Thanksgiving or fall event! 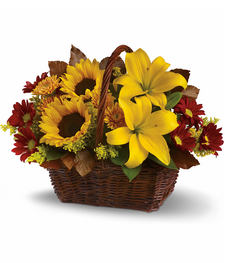 This is a perfectly presented basket full of fall flowers that will lend instant autumn beauty to any home...and it's only $39.99, though it looks twice the price! Absolutely gorgeous! 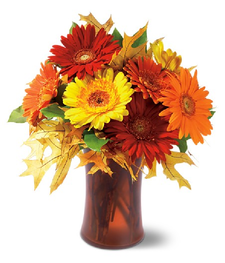 Bring some vivid gerbera daisies in this vibrant fall flower arrangement, and make your hosts smile as soon as you arrive! This is another great deal at only $39.95, regularly $59.95...which saves you an extra twenty bucks because it is ON SALE for Thanksgiving! Presto! Your host or hostess gift is taken care of, and you didn't have to spend much to make an excellent impression (and be invited back again! ).